TRADITIONAL NAMES: ‘Ē (RR), ‘E‘e (MG), Vēvē / Ēē (AT), ‘Ē‘ē (MK AK), Vīvī / ‘Ē‘ē (MT), Manu Nīkau (TS TW); COMMENT: Mitiaro - most say Vīvī for female and male; some say Vīvī for female and ‘Ē‘ē for male. 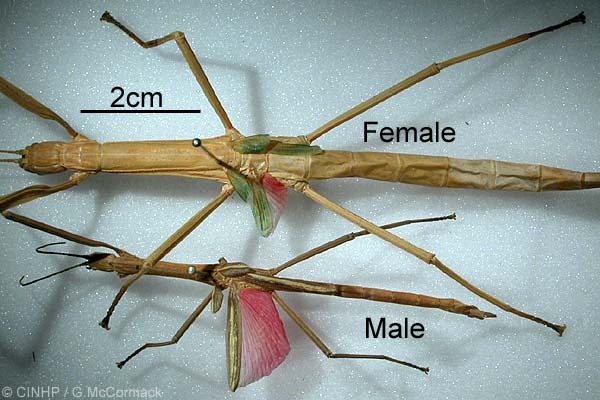 KEY FEATURES: Slender, female to 120x6mmBL, male to 70x3mmBL. 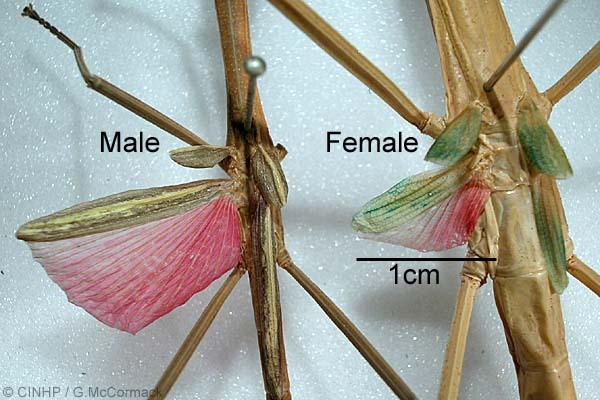 FEMALE green; legs slender and long, to 80mm; wingcovers short, to 6mm, green; wings short to 10mm, front green, rear reddish. 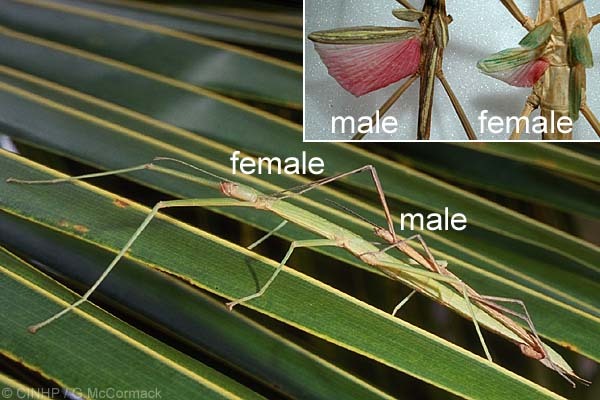 MALE brown; legs slender and long to 50mm; wingcovers short 5mm, brown with pale stripe; wings long, 20mm, front brown with pale stripe, rear reddish. GENERAL NOTE: A native of the Orient which has dispersed as eggs by rafting and assisted by early people transporting Coconut Palm planting material. Actual native range unknown.